Changes to critical IT systems are a daily part of any IT organization’s ability to meet the constant barrage of requests for improved, faster and more efficient services. Without any means to track what has changed, an IT organization has little ability to know what change was the root of a data breach or what caused a system to stop functioning properly. 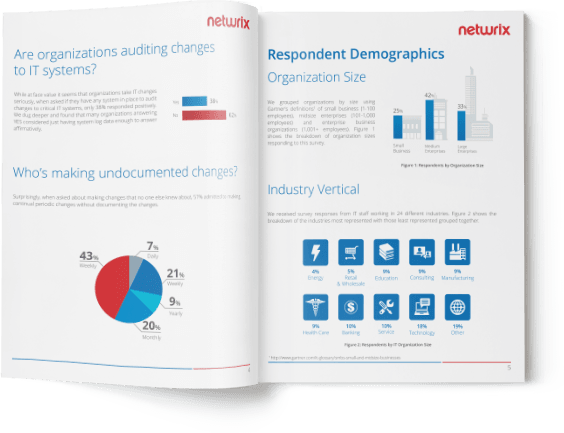 The report provides an idea of how organizations today see the impact of changes made, the use of change auditing and the methods and processes intended to maintain security and system availability. of surveyed IT pros have made changes that caused services to stop. of IT professionals have made a change that was the root cause of a security breach. of companies have little or no real ability to audit the changes made, revealing serious gaps in meeting security best practice or compliance objectives.